The Hubble Space Telescope captured what looks like a colorful holiday ornament in space. 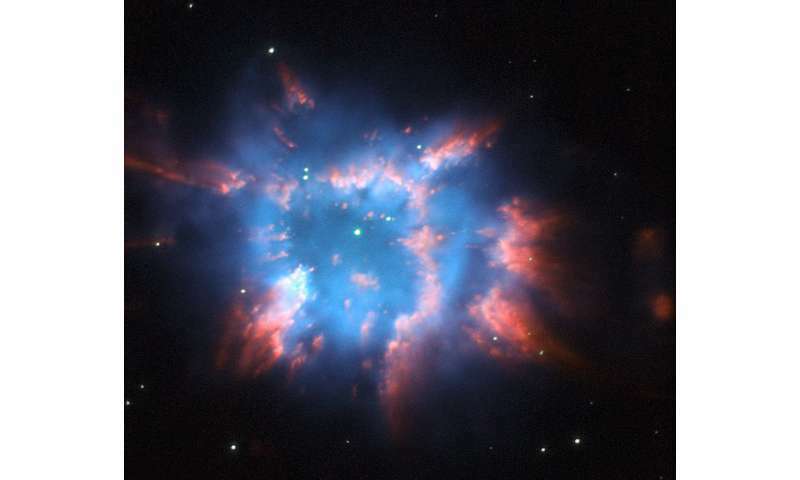 It's actually an image of NGC 6326, a planetary nebula with glowing wisps of outpouring gas that are lit up by a central star nearing the end of its life. When a star ages and the red giant phase of its life comes to an end, it starts to eject layers of gas from its surface leaving behind a hot and compact white dwarf. Sometimes this ejection results in elegantly symmetric patterns of glowing gas, but NGC 6326 is much less structured. This object is located in the constellation of Ara, the Altar, about 11,000 light-years from Earth.